In the second assignment, Common Pastures volunteers worked to educate small farmers on the ways they can supplement feeding of their goat and sheep flocks with resources already available to them. Malian farmers were taught how to make molasses mineral blocks, treat silage, and process cassava to provide additional nutrients to their flocks during the dry season. 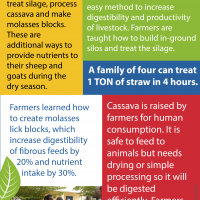 This is part three of a four-part infographic series that shares information on our work with the Farmer-to-Farmer Program in Mali.